Yesterday I wrote that I thought Frederick Forsyth had made a humorous gaff -- claiming that one could date a painting on panel by counting the grain lines on that panel. It struck me as funny. How could one know when the panel was cut just by counting the grain/rings of the tree it was cut from? At the most (it seemed to me) one might be able to conclude how old the tree was when it was cut down -- but not WHEN it was cut down. One can date Northern European oak -- meaning: One can tell when the tree grew and was cut down, not so much by counting the grain/rings, but rather, by observing the grain rings. See, what I didn't know, and Mr Forsyth didn't include in his narrative, is that all oaks that grow in the same climate/weather conditions, will have similar size and order of size to their growth rings. Because weather patterns of (for example)one dry year followed by one wet year will show up in the size of the growth rings of those consecutive years in all the oaks of the region, the patterns will be the same in all the oaks of the region. Therefore, one can tell the period of time in which that tree grew -- not just how old it was when cut. Further, what I found out is that these patterns of growth rings in European oaks have been catalogued for this very use. The other side of that coin is that because of those growth rings, we also know the relative weather of a given year in Northern Europe because we know how fat or skinny that year's ring is. Incidentally, there is a sort of correlary in the clay world. Maybe I'll post about that tomorrow. “But, Jimmy, that isn’t the boy scout way, now is it?” Mr Wampler sternly replied. Of course, if there was humor, it was in the notion that you could date a guitar by counting the lines of grain -- the growth rings of the tree. This tickled my funny bone as it seems to me to be a pretty typical kind of conflating of two factoids -- 1. the ability to be able to detect the age of a tree and 2. the ability to determine the age of an object made out of that tree. Well, you coulda knocked me over with a feather as yesterday I was "reading" (audio book) a Frederick Forsyth short story in which he does exactly that irrational conflation. The short story centers around an art auction house in Great Britain. The art expert explains that when Italians paint on panel, they paint on poplar and when Northern Europeans paint on panel, they paint on oak. Therefore (so Forsyth explains to us, via his fictional expert), it is easier to tell the age of a painting done in Northern Europe because oak has growth rings evident in the grain and poplar does not. 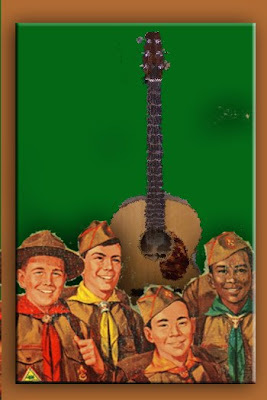 Apparently Mr Forsyth got his novelist merit badge as a scout in Mr Wampler's Boy Scout troop? Carl Sandburg once wrote about fog that "crept in on little cat's feet". Carl Sandburg never met MY cat "Crush". If he had, he would have modified the description to include the thunder that would no doubt accompany a 17 pound cat's footfall. Crush doesn't "creep". When Crush enters a room the floorboards bend and anything on the floor that is loose and round rolls his direction. Crush has small cats orbiting him. I was making Jack O'Lanterns on a day that I happened also to be thinking about my two cats, Crush and his brother, Moose. I decided I had to see what a Jack O'Lantern would look like as a Cat O'Lantern. After all, cats seem also to go hand in hand with the Halloween spirit. 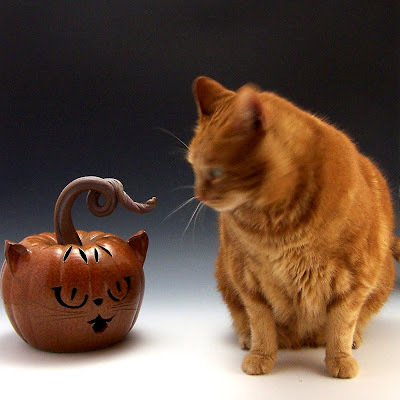 This Cat O'Lantern lights from within with a candelabra bulb and socket that clip into a small hole in the base of the piece. "So, is this pottery thing just a business? Are you in it for the money?" ....after we stopped laughing at the notion of "...in it for the money", we'd most likely answer that we're in it for the living. And even if we didn't make money from the pottery, we'd most likely still find a way to keep our hands in clay. 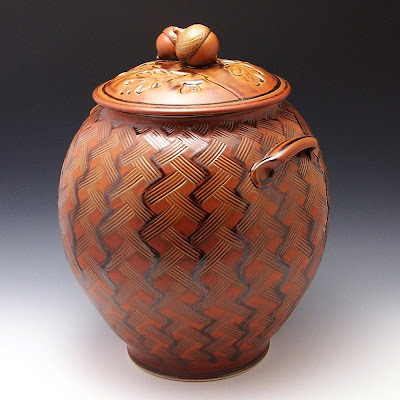 And that difference of perspective between the joy of clay and the necessity of business is also evident in the way I like to sell my pottery. 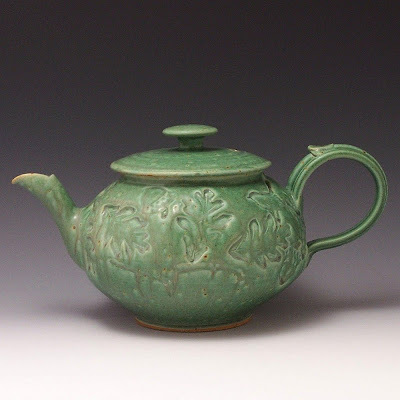 For over thirty years now, I've chosen to sell all of my pottery at art fairs. Sure, most of the reason for that is the fact that art fairs have always been the most cost effective way to market pottery. But an equally important part of that choice for me has been the face-to-face contact between me and the people who are choosing my pottery to take home with them. That personal contact is both gratifying and educational. 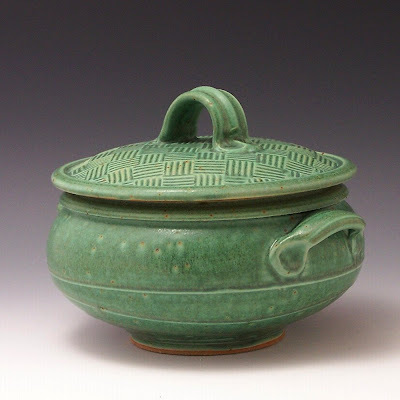 The feedback -- both positive and negative -- helps me improve my pottery in ways that less personal marketing could never do. And that personal contact helps to reconfirm that a livelihood chosen with something in mind besides simply "business" was a worthwhile choice. And so it was that when trying to decide whether or not to venture into internet sales, the choice was not all that simple for me. I could see the sense of a market expanded into areas of the country to which I've never yet traveled (for art fairs). And last year when gas went over $4.50 a gallon, I could certainly see the wisdom of being on the road less. But I wasn't sure how much I'd like the impersonal nature of the whole internet thing. It just struck me as odd to make such a hairpin turn down the marketing highway from personal contact to nothing more than words and pixels on a computer monitor. But it hasn't been exactly as I expected. 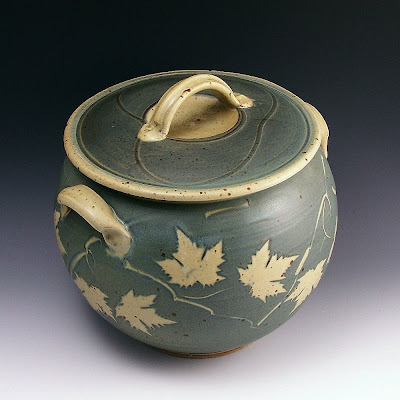 Though I never meet the people who now live with the pots I make, I do get feedback. I do hear what folks like and don't like in the pots. And I've come to know a few people across the country -- people that I'd never have otherwise met. Through a paypal glitch caused by neither of us but requiring further communication, I had the pleasure of talking to and further "meeting" my best Etsy customer, Doreen. From that brief but friendly phone conversation I came away knowing that my pots were in a VERY good place, indeed. And now (my long-winded introduction coming to a close) I've had the further pleasure of great "feedback" from a customer who found a very special way of showing me my pottery in its new setting. 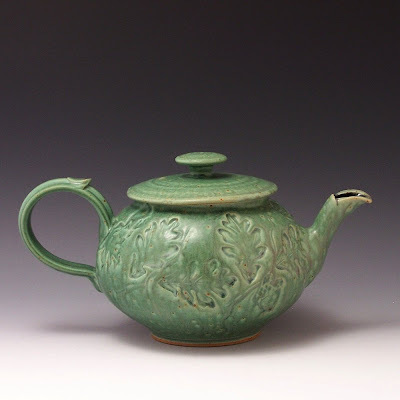 Nancy McKay bought the teapot (pictured above). Nancy is a very talented photographer who graced me with more than just a written post thanking me for the pot. 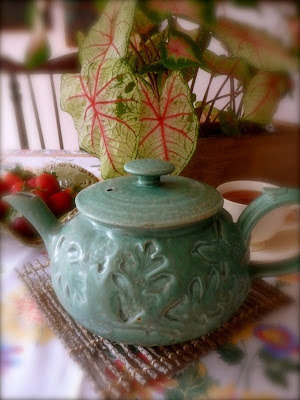 She added beautiful, artful photographs (below) of the teapot in its new home. I think I could grow to like this new internet marketing. About ten years ago, my small Hoosier town was nearly taken over by huge flocks of blackbirds. Watching those flocks fly into town was amazing. The collective flight of blackbirds is like -- remember those kid's toys -- you draw pictures with metal filings using a magnet? The flocks change directions so quickly and collectively that they look positively swarm-like. I wonder what'd happen if the lead blackbird had a turn signal go out on him? Every evening from late August 'til late October all the trees in our town came to life with millions of 'em. They'd swarm in from the fields surrounding the town, settle into the trees and chatter for hours -- like school kids at a slumber party -- until they finally fell asleep. Back in those years I lived in a house in an older section of town. All my neighbors were in their 80's. It was like being surrounded by grandparents -- and nobody watches out for you like grandparents. Through their mostly drawn shades they’d keep a watchful eye out for us. And, worried hens that they were, regularly they’d bring us baked goods. If we seemed to be working overtime with the pottery, sure enough, there'd be a rap on the door and a pot of chili, maybe some homemade bread would be there on our back stoop. We all gardened our small back yards-- but they canned their harvest -- and my wife and I reaped the benefits. 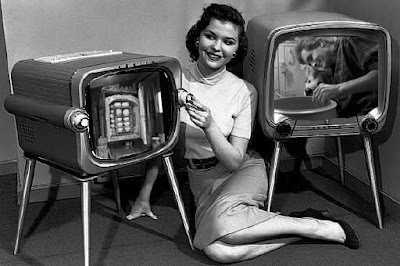 Those were good years. Next door lived a true country renaissance woman. Lacy was an energetic eighty-something (she carefully did not tell us exactly HOW 80-something) who told us stories of her rural Indiana life – a life that included the fact that she had given birth to her three kids at home. She had some pretty gruesome tales of home medicine – like stitching cuts on herself and kids. No anesthesia. Yikes). But boy, Lacy hated those blackbirds. Most of the older folks did. They feared ‘em as a potential plague carrier. In Lacy’s back yard were two enormous Ash trees. Every evening those trees would fill with blackbirds – so many and so loud you could barely talk over the bird’s chatter if you were standing under them. I was in the kitchen one such evening when I heard Lacy out on her driveway clapping her hands and trying to shoo them off. I went down to my basement and, with a 1X4 and a flap of rubber, I made Lacy a very loud clapper. I made it so you could hold it in your hand (I band-sawed out a handle) and with a casting motion, clap one piece of 1X4 against the other piece hinged to it with the rubber. I proudly took it over to her the next day. As evening came on, we gave it a try and, sure enough, the birds loudly exited – a thousand wings beating retreat. But the next day, though they fled again, they circled and came back. Pretty soon we would use the clapper and they would barely stir -- maybe a few birdcalls twittered from the lower branches and “telephoned” their way up, informing the upper branch birds that it’s safe to just stay put. …watching and laughing themselves silly at the crazy guy down below making the big noises with the sticks. 77 Ceramic Strip -- Kooky, Kooky, lend me your comb...so's can texture this pot. "Personally, I'd like to know a guy's pottery creds before I'll befriend 'im. If he don't know clay, he don't know nothin'. I'm sorry, but that's just the way life is. I don't make these rules. I just enforce them. Okay, I don't enforce them, but I believe in them. A little. Okay, really I don't even believe in them but I hope others might. I know they don't, but I hope they might because, after all, how much better wouldn't the world be if everyone understood clay a little better?